Australia’s leading Musical Theatre Producer John Frost says his hometown of Sydney has lost the theatre crown to Melbourne. He describes as ‘diabolical’ the loss of one of the city’s theatre jewels as a viable space for large musicals. David Spicer reports. John Frost likes to dominate a market. In 2014 he is producing Grease, The Rocky Horror Show, Wicked, ONCE, with the Melbourne Theatre Company, Anthony Warlow's concert tour with Faith Prince, and, with Opera Australia, The King and I. This follows a cracking 2013 that included a Julie Andrews tour, Driving Miss Daisy with Angela Lansbury, A Funny Thing Happened on the Way to the Forum with Geoffrey Rush, South Pacific and Legally Blonde the Musical. He sometimes quips that he would give the legendary theatre producer J.C Williamson a run for his money. But sitting in the stalls of the Queensland Performing Arts Centre during a media call for The Rocky Horror Show John Frost is almost shaking with frustration. Rocky can’t get into Sydney in 2014 because of a lack of venues. 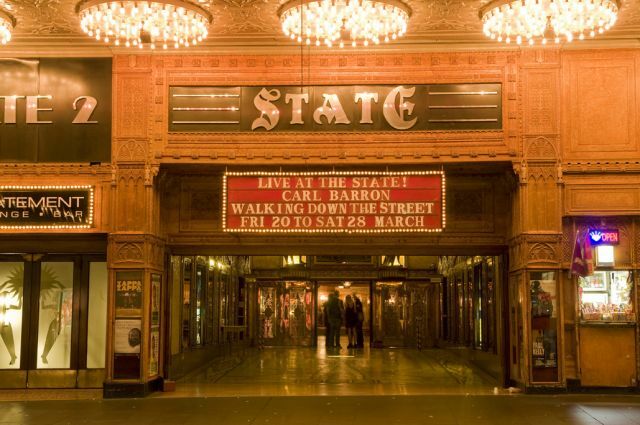 The State has been described as Australia’s finest historic theatre. The palatial features of the foyer are breathtaking. The problem is that the stage is too small and irregular for large musicals, so it is used primarily for concerts. John Frost says there was the opportunity to extend the stage when the owners purchased an adjoining building. But instead of making the stage larger, extra space was used for a 196 room New York/Venetian style hotel and day spa. The hotel is now open for business, a decision John Frost describes as ‘diabolical’. Fellow theatre producer Rodney Rigby is also frustrated. “There are lots of wonderful global shows in the marketplace at this point of time. If you want to book a theatre in Sydney or Melbourne you have to wait a long time. He says the lack of venues in Sydney has a flow-on around the country. “You have to play in Sydney and Melbourne and there is only one venue in Brisbane. As well as venue crush, producers also have to deal with fickle audiences. “We sold 95,000 tickets for Grease in Sydney. In our first week in Melbourne we had already sold 103,000. “Melbourne does it well. It’s about educating the people that theatre is a major part of life. Like going to the football or cracker night. The Manager of the State Theatre Manager John Murnain says there have been positive spin-offs from the building of the hotel. He also disputes John Frost’s interpretation of the redevelopment. “The hotel is no-where near the stage. We don’t own the other building (next to the stage). So it looks like the door is shut. 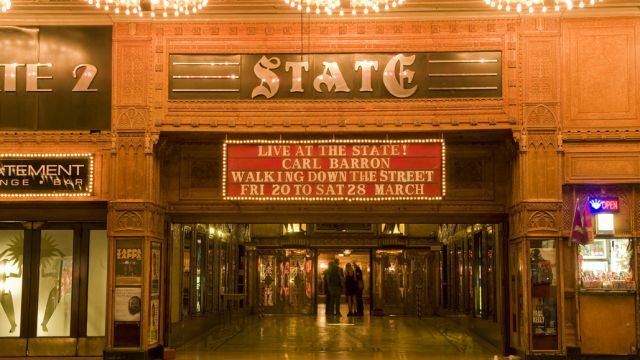 Concerts and film festivals will be the only way to enjoy a night of magic in the State Theatre.